Michael T. Bowers, PhD is the lead author of a recent publication in Nature Chemistry titled, Ion Mobility-Mass Spectrometry Reveals a Conformational Conversion from Random Assembly to β-Sheet in Amyloid Fibril Formation. 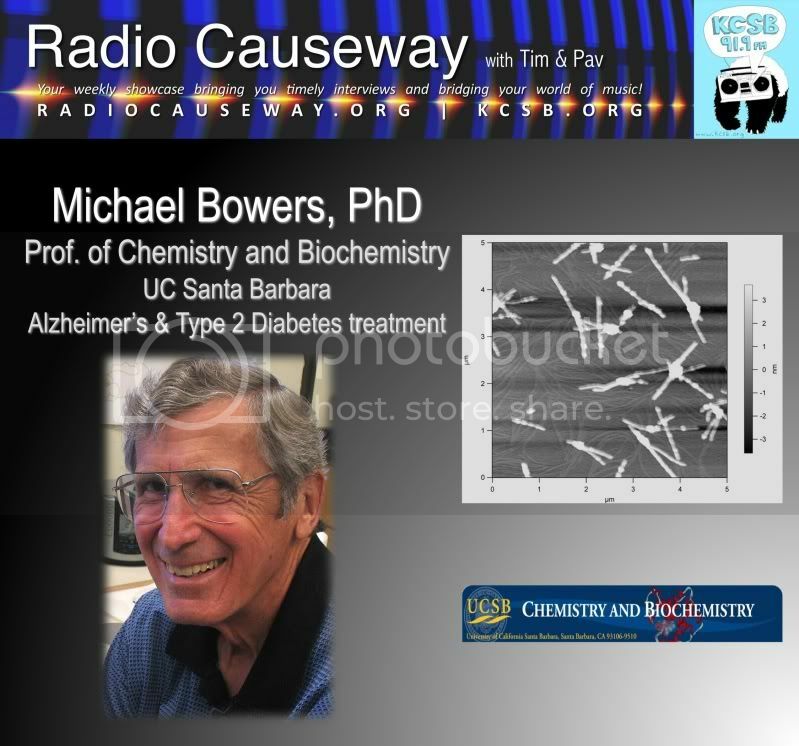 Dr. Bowers comes to Radio Causeway to talk about his group's research that have uncovered a potential breakthrough in the treatment of amyloid diseases such as Alzheimer's, Huntington's, and Type 2 diabetes. Dr. Bowers is the director of the Bowers Group and a Professor in the Department of Chemistry and Biochemistry at UC Santa Barbara. The Yeah! Free Music! pick of the week is Adios Noviembre from Guadalajara, Mexico based, Hey Chica! Plus new music from former guests, The Mattson 2. Today we play Pleasure Point off their new album from Galaxia Records titled, Feeling Hands. THE MATTSON TWO from EMBRY RUCKER on Vimeo. Listen live Tuesdays from 9-10AM pst on KCSB.ORG | KCSB-FM 91.9 in Santa Barbara!